Surprise is a key word in the film world. When we talk about surprises then we deal with expectations, lust for experience, for something new, anything a film (ideally) is supposed to provide. There's a surprise always present when it gets to developing, evolving, educating oneself. One learns from making mistakes. One is influenced through a surprise, a discovery. As a young boy I was very surprised when I understood that it's basically possible to see a film every day on TV. Each night there's a possibility to escape to another world. And so I did. In fact I still believe that film-watching is a kind of a travelling to another world, with another rules, colours, atmosphere... Film-making is creating these new worlds. So, as long as a film deals with that or just pulls me in itself, it is a good film. My first „holy triangle“ was Trainspotting (by Danny Boyle, 1996), Kids (by Larry Clark, 1995) and Fight Club (by David Fincher, 1999). These films I would never get tired of. Each time I saw them was a new revelation. Each time things and happenings were delivered in a different perspective. The most powerful part of these three is that they create such a complete and maybe even a little bit desirable ( at least for a 16 year old ) worlds. Back then I didn't know anything about camera movements or scriptwriting tips but these films, they created a wanting to be and feel the same way as those characters. I feel and I breathe along. I think this is where good film-making starts. Well, then came Godard. I saw Pierrot le fou (Pierrot Goes Wild, 1969) in the only art-house cinema (thank God we have one) in Tallinn and these rules that had earlier surrounded me without me even knowing it – these rules were cancelled. Jean-Luc Godard showed with this one film that film can be a piece of art, yourself, memories, a message, a piece of the director's world, a piece of his heart. That it is something more than plain storytelling. Film is creation. You see, I grew up with films being shown on TV every night and they had become a common view for me. Just like any other program on television. A disease of the generation? Maybe. But with the help of Godard it came to me that film directors make films not only to satisfy a viewer's taste but also in order to say something, to express something hoping that the audience would connect it to it's own ideas, thoughts. Film awakens and asks questions. Ferdinand (Jean Paul Belmondo), a recently fired TV advertiser, weary of shallowness of his bourgeois family and friends, whose dialogue at the party sounds like TV advertisements, leaves his family with Marianne (Anna Karina), who for reasons unknown to Ferdinand keeps calling him Pierrot. They flee to the Mediterranean, where they live by hunting and fishing, or telling stories to tourists. Soon Marianne gets fed up with it and leaves Ferdinand. Ferdinand finally sees her with her boyfriend and shoots at them killing both. He paints his face blue and wraps the strings of (yellow and red) dynamites around his head, ignites the wire, then changes his mind trying to put it out, but it is too late and it goes off. When Jean-Paul Belmondo walks through a window to enter a cafeteria, or eats a humongous piece of cheese with pasting mustard on it, or when with Anna Karina they perform with a little show about the Vietnamese war to the American soldiers - that's where rules are broken. People in films may do anything, like in dreams. Everything looks kind of real but acts kind of different. We believe it while we see it, when it's over we think about it, try to understand what we were shown and then hope to see it again. 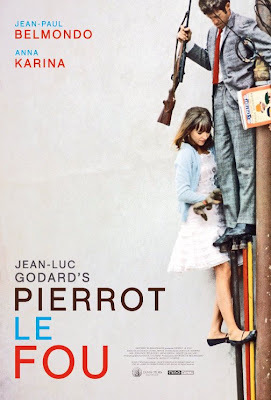 I saw Pierrot le fou once again in a local London film theatre. It was a refreshing experience. It is pure cinema and should stay in film-theatres and I refuse to see it on any other medium. 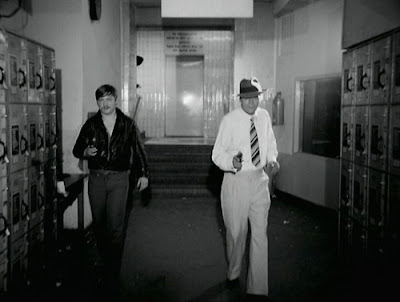 Then there is Rainer Werner Fassbinder. There was a Fassbinder week in the same art-house cinema, SÕPRUS. Many new surprises came along with Warnung vor einer Heiligen Nutte ( Beware of a Wholy Whore, 1971 ) and Götter der Pest ( Gods of Plague, 1970 ). I was intruduced to a wholly different style of film-making. The key scene for it would be the ending of Der Amerikanische Soldat ( The American Soldier, 1970). R.W. Fassbinder was the director, scriptwriter, artist, actor and composer for this one. He plays Franz Walsch, best friend of the main guy – Ricky, who( working as a hired killer ) fulfils some assignments, spends some time in childhood haunts with Franz, visits his mother and brother, waits in his hotel room, murders his whorish mistress, and, in the last scene, gets cornered by the cops. Ricky's mother and brother appear at the same moment when he and Franz get shot. It is hard to describe and deliver the feeling that I got but I must say that I hadn't seen anything so rude (and cool!) before. The image tells such a great story without any words being spoken. It was the ending I had never seen before. It was perfect with it's sad and melancholic touch while all the film had been black and white and kind of dark, film noir style. It's longitude gave just the right tone for the ending, creating a chicken skin feeling and for a second it seemed to me that Fassbinder made the whole film in order to reach the ending sequence. Then for a time it became rare being surprised by films. All the boundaries had been crossed. Everything was done. And then came film school. I started to watch the classics. Just when everything seemed to be clear, there came Antonioni. 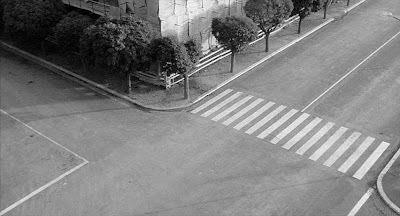 During the first time I saw L'Eclisse (Eclipse, 1962), it was already giving me a strange vibe until it reached the end – the lonely street. Empty street, camera-angles change, time passes, wind blows in the treetops, waiting for the lovers to meet at 8 o'clock. The meeting is never shown. The film ends a moment earlier. They will meet at some time but so far the street stays empty. It's not easy to create an atmosphere. But I believe that if a director manages to create one, he has also the ability to surprise us. The Waiting is in the air and very present in L'eclisse. We are held in the hands of the artist until the very end. The ending of L'Eclisse is one of the best endings for a film I've ever seen. It proves (once again) that images tell such a more powerful story than any script ever could. Just like the title already indicates - the whole film is an eclipse, eclipse of feelings, a choice of the director, what will be seen and what not. We will never know if Vittoria and Piero met in the usual place at 8 o'clock. Time passes, light changes, people pass by, new faces appear that haven't been shown before, but no news of the main characters. The ending shot is of a street lamp filling the screen with strong light reminding the eclipse of the sun. Antonioni has been accused of keeping secrets from the viewer – I believe it's just his way of storytelling. His way of cinematic language. There are no written rules to it. Sometimes incompleteness is the most complete way. I've been making a film inspired by Ultramelanhool for many years now. First I wrote the script for 4 years, then started shooting (which took another 8 months) and now am editing it (maybe another year). Then I saw Control (by Anton Corbijn, 2007) and saw there a lot in common with the film I was working with. It was a different kind of surprise. It was surprising to see my ideas in other's films. Well, not totally one-to-one my ideas, but there were similarities. Surprising to see that I think alike with some others. Is it a good thing? Am I influenced or are they my own thoughts? Some films are a must see, others are advisable-to-see, and then there are these films that pop up every once in a while (introduced by a friend or seen unexpectedly on TV) and put a spell on me with just one tiny detail. The rain scene in Ma mere (by Christophe Honore, 2004) where Louis Garrel is running on a street screaming a paragraph from the Bible into the falling summer rain – almost a cliché in its simplicity and yet so convincing and inspiring in its honesty. London (by Hunter Richards, 2005) was another kind of surprise. A text so clever, funny and (once again) honest, delivered far-better than believably by the actors and the whole simple storyline being told so well. For those simple reasons London keeps it safe place in my top 3. Because, in the end, it is in the eyes of the viewer - the ability to stay surprised. A child gets tired of one game, he starts another one. As long as the will to play, to create and accept new worlds never stops. Mõni lihtsalt on, noh, kommenteerimatu.